Plan your migration path to a next-generation ERP that delivers great performance and dramatic new problem-solving capabilities. What’s the Impact of SAP S/4HANA on your ERP Strategy? No matter whether you are approaching migration to SAP S/4HANA as a technical upgrade or a true business transformation, the first step in your journey should be understanding your current environment and what SAP S/4HANA can bring to your business. Our migration guide provides a framework, broken down into bite-sized pieces, to help you assess your current environment, learn more about how SAP S/4HANA will impact your business, and prepare for migration. Review of a Gartner Research Note entitled, What Customers Need to Know When Considering a Move to S/4HANA. When is the Right Time to Migrate to S/4HANA? Every business is different, but we believe these factors are important as you consider whether it’s time to migrate to SAP S/4HANA. Even if you have no interest in the strategic benefits of SAP S/4HANA, there are plenty of good reasons to make the move well before 2025. Practical steps you can take now to assess and optimize your current environment. A conversion proof of concept can help to determine if a system conversion is the best option. Look at your existing environment to see what needs to be addressed prior to conversion. Learn about steps you can take now to work ahead and be ready for future migration. Invest time now to understand S/4HANA, how it differs from previous SAP ERP systems, and how it can benefit your business. To learn what SAP S/4HANA will mean for your organization, itelligence provides a framework, broken down into bite-sized pieces, to help you assess your current environment, learn more about how SAP S/4HANA will impact your business, and prepare for the transition. Let us help you assess your current environment and build a roadmap for moving forward. We use a structured methodology to identify areas to simplify, improve or enhance, using actual data from your systems. Build confidence in the S/4HANA conversion approach, reduce the overall timeline and associated fees, and limit risks. Gain insight into system usage, database space consumption, custom code and more. Custom code is an area of particular concern for customers considering S/4HANA migration. Learn how we can help. Finding opportunities to minimize the size of your existing database can translate directly to reduced HANA license costs. Streamline and reduce the future conversion project timeline by taking steps to convert customers and vendors into business partners now. Clean up master data now to ensure you are bringing quality data over into the S/4HANA environment when you convert. Educate your team about powerful analytics capabilities designed to improve efficiency and effectiveness of business processes. Get an introduction to SAP Fiori and an opportunity to participate in hands-on exercises. Understand the new security considerations for SAP HANA and SAP Fiori, using a hands-on approach. Get up to speed with powerful new coding techniques to leverage the SAP HANA database. 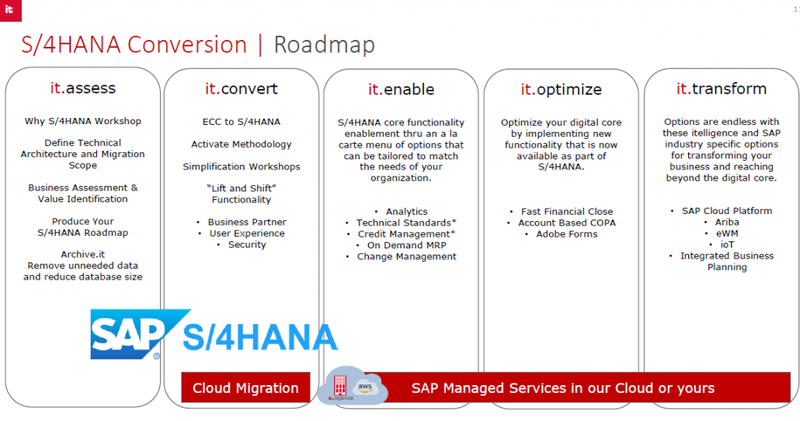 Ready to Migrate to SAP S/4HANA? Our SAP Qualified Partner-Packaged Solution approach to SAP S/4HANA system conversion is a popular transition path to convert your existing ERP system to SAP S/4HANA. Discover more about our Smart System Conversion, which will facilitate your journey to the next-generation business suite. 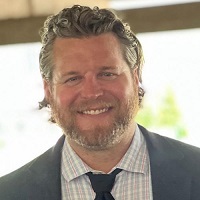 As a full-service SAP service provider, itelligence recognizes that there is no one-size-fits-all approach to SAP conversion. We have created packaged offerings to help guide our clients and tailor migration approaches for near-term and budgetary estimates. Our basic philosophy includes the following services, each of which can be combined or selected as a la carte options. Aims to help clients and prospects define the value of digital transformation, conduct educational sessions on S/4HANA, supply inputs to business case definition, and provide technical evaluation and budgetary estimation. Converts SAP ECC Clients to S/4HANA in a one-step process (if prerequisites are met). We aim to “lift and shift” the functionality in the quickest, most risk-averse manner to speed return on investment (ROI) and limit consulting services. S/4HANA core functionality enablement through an a la carte menu of options that can be tailored to match the needs of your organization. Optimize your digital core by implementing new functionality that is available a part of S/4HANA. Provides options for reaching beyond the S/4HANA digital core by adopting leading-edge technologies to change the form, fit and function of a business process; create agile responsiveness to new business models, customer segments and products; and leverage new technologies to gain competitive advantage. We offer a fixed-fee, one-step conversion from SAP ECC 6.0 to SAP S/4HANA on premise, in your cloud or in our private cloud. Forrester study that examines the potential return on investment a business may realize by deploying SAP S/4HANA. CIOs in the SAP ecosystem know that a move to SAP S/4HANA is inevitable, and they generally fall into one of three camps: transform, optimize or procrastinate. Get an overview of three transition paths to SAP S/4HANA and reasons why it’s better to move now than later. Learn about practical steps you can take now to assess and optimize your current ERP environment and build your migration path to SAP S/4HANA. Discussion and access to download a complimentary copy of Gartner Research Note entitled, What Customers Need to Know When Considering a Move to S/4HANA. SAP S/4HANA Migration: When is the Right Time? Agile and flexible SAP cloud services and infrastructure to the needs of your business with the itelligence Private Cloud Edition for SAP S/4HANA. Are you searching for answers or would like to receive more information on SAP S/4HANA migration? Do you want more detailed advice from our experts?